You have to bear in mind that some of the things you are going to read here are really unbelievable because all of it has to do with teaching a baby. Actually, it is about teaching a baby to read and about teaching a baby maths. It is also beyond my belief. I guess some of you will smile in disbelief while reading this post. Believe me…I take it with a pinch of salt as well. Will the Doman work with my child or not? We will see in the future. The most important thing that you should always bear in mind is that whatever you do with a baby it develops its brain. Never forget this. So far my baby and I like this experiment. Of course Maja has some bad moments from time to time but we are making progress all the time. I am sure there needs to be something special about the Doman method because it is so popular around the world. We will see the results in a few months or maybe years. Until that time I am going to document our play and learn game. problem solving – a child chooses the correct answer from the two answers given (if he/ she is willing to do so). 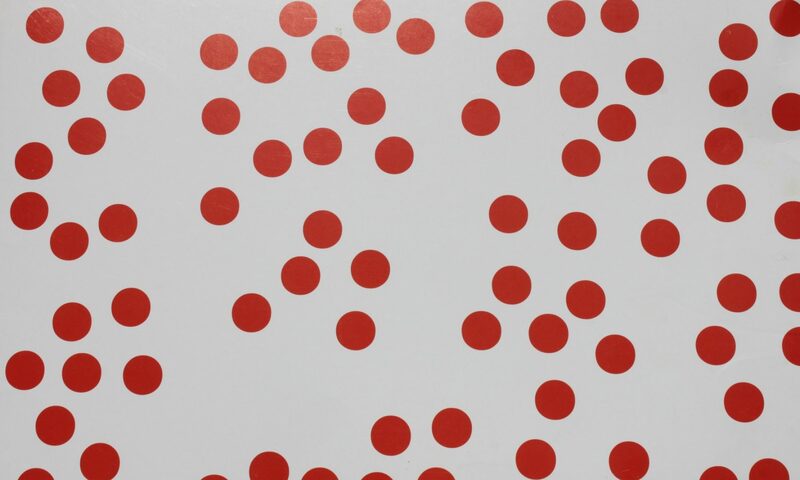 We are still in the first level of the Doman method regarding maths which means working with red dots only in view of the fact that our baby is still really little. Our maths programme is not so intensive as before (6 sessions introducing numbers + 3 sessions with equations) and that is why we can combine maths with reading. It seems it takes some time to describe it but, actually, it takes less time when I just say it quickly. As I have mentioned before, the faster, the better and I am really rushing through the session. What I do next is hugging, kissing and praising my baby, telling her how clever she is which is in accordance with Doman’s recommendations. The kid can choose the solution if she wishes to do so. 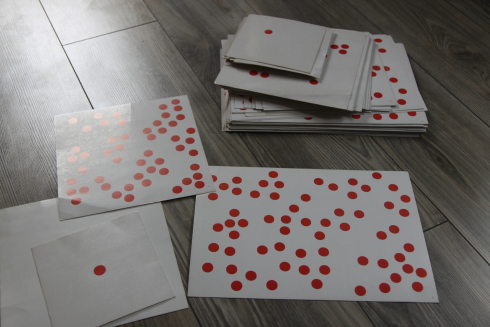 If she is willing and she chooses the correct number of dots, I praise her again. If she chooses the wrong card, I say calmly that it is the other card and I thank her for choosing. If she doesn’t want to choose any of the cards, I do not press her but just show her the correct card and we start playing something different. I have been implementing Doman’s reading porgramme for more or less three months. The picture below shows the words my baby has already seen. I put them away into a special box. Following Doman’s advice we started with 15 words which were most familiar to my baby at that time. Unfortunately, I couldn’t find any of those in the ready-made set of cards I had bought. Therefore, I had to print all the first words. It was impossible to find exactly the same font as I had on the ready-made cards but I am sure the font is not so important as the size. According to the book, “How to Teach Your Baby to Read” we don’t have to print the words. Handwriting will do as well. In fact, I got a red felt-tip pen together with the cards probably for this purpose. Maybe I will use it one day. One cold wintery evening we started our reading programme with a set of five words from the list above. I showed her this set 3 times. The following day I added the next set of five words and I showed her each set 3 times (6 sessions altogether). On the third day I added another set which I showed 3 times. I presented all the previous sets the same number of times (9 sessions together). I continued to show 3 sets, 3 times daily each for the consecutive 5 days. After 5 days, following Doman’s advice, I put away 1 card from each set and replaced it with a new one. As Doman says in his book, when we feel quite confident with 3 sets of cards, we can add the 4th one and I did this. Since then we have been having 12 sessions of reading each day as each set is presented 3 times daily. Doman suggests adding the 5th set when we feel confident with four sets but I decided not to do it. I added the 5th set but not with word cards. I am a teacher of English and I have lots of picture flashcards and I decided to make use of them as well. I go into details concerning this later. 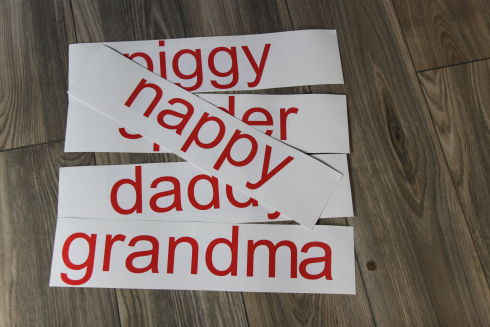 After my baby had seen all the 15 words from the list (the most important words for her in my opinion), each word 3 times daily for 5 consecutive days (each card was presented 15 times), I started putting away the cards and adding new words related to the baby’s surroundings. I use the ready-made set by a Polish publishing company. We started with nouns. Later on we had verbs and at present we are doing adjectives and colours. I am trying to show her the meaning of words while I am showing her the card or even before to make the session even shorter. Every day I put away 4 cards and add 4 new cards so I know before which card comes next. If I think my baby doesn’t know a word, I try to say it to her a few times the day before in different contexts. Whenever possible, I try to show her the meaning by pointing to things in our house. I sometimes show her the objects I know they will appear soon on the cards a day before. As far as colours are concerned she had been exposed to all the colours long before she saw their written form. I used to show her the flashcards with different colours. The “lessons” with verbs were longer. I followed Doman’s advice to show all the actions on me and on Maja if possible. As I have said before, I felt that I wouldn’t manage the fifth set of reading cards. I followed the cues Maja had given me. Four sets were enough for her attention span. However, I had something different in mind. I left the fifth set for the Polish set of reading cards which my husband is supposed to introduce soon. We have the fifth set but with pictures only. I noticed that even if she is not in the mood to look at the words even for a second, she is always interested in pictures. 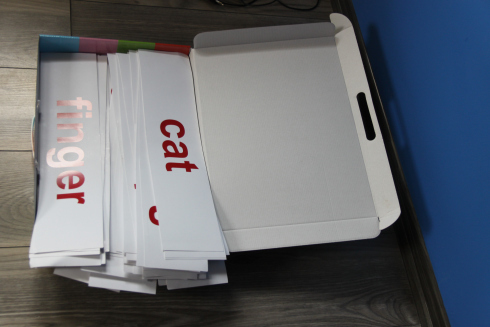 Actually, the picture flashcards have been present with us since the first month of Maja’s life. For the visual stimulation I printed the cards which I downloaded from Brillkids. 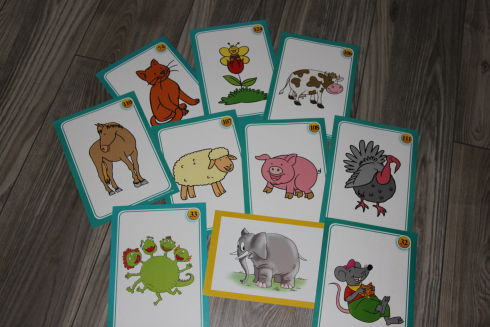 Then, we stopped using them for some time to return to them again until I had an idea to continue with picture flashcards using all the cards I have. 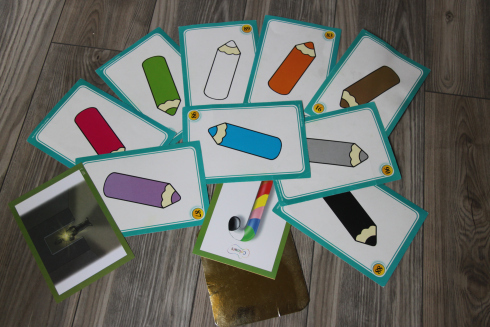 After I had shown my baby all black and white visual stimulation cards I started showing her colourful cards from my collection as a teacher of English. 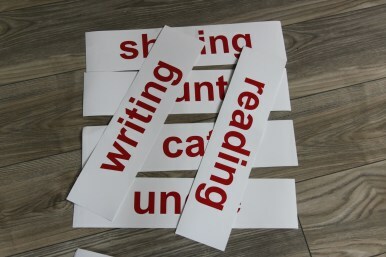 I present picture flashcards following Doman’s principles regarding reading or maths, i.e. I started with 5 cards which I presented for 5 consecutive days. After 5 days I put away one card and replaced it with one new. Since then, I do this every day. I present the set as quickly as possible. Following my idea of raising my baby bilingually and the challenges of non-native bilingualism, I present all the cards in English. 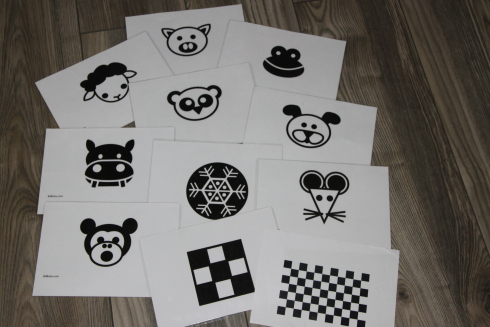 black and white visual stimulation cards for babies: animals, different shapes. I long for her attention span at that time….she could look and look and look at one card for ages and now I am happy if she looks at it only for a second. That is why I regret I hadn’t introduced maths and reading programme earlier. Have you found my experience useful? If yes, share with others. Have you started teaching your babies and toddlers or are you waiting for school? I would be delighted if you leave a comment and share your experience. You are invited to follow Facebook fanpage and to subscribe for this blog (a box on the home page). Notify me about the following blog entries. You can turn on notifications without writing a comment.